Oscillatory activity in the higher (gamma) frequency range in electro- or magnetoencephalogram (EEG or MEG, respectively) has been proposed as a correlate of cortical network synchronization. 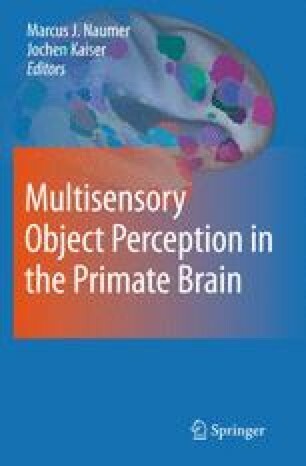 This chapter reviews the evidence for an involvement of gamma-band activity in multisensory integration. The relevant studies are grouped by the level at which oscillatory EEG or MEG data were analyzed. The first section describes reports of topographically unspecific or widespread spectral activity. The second part focuses on studies demonstrating topographically local activity both at the electrode/sensor level and at the cortical source level. Finally, reports of cortico-cortical interactions as suggested by EEG/MEG coherence or phase synchrony are summarized. Gamma-band activity increases have been reported for temporally, spatially, or semantically matching bimodal stimulation. Some studies, however, have reported enhanced oscillatory signals also to incongruent stimuli, suggesting an important role of task requirements and attentional factors.